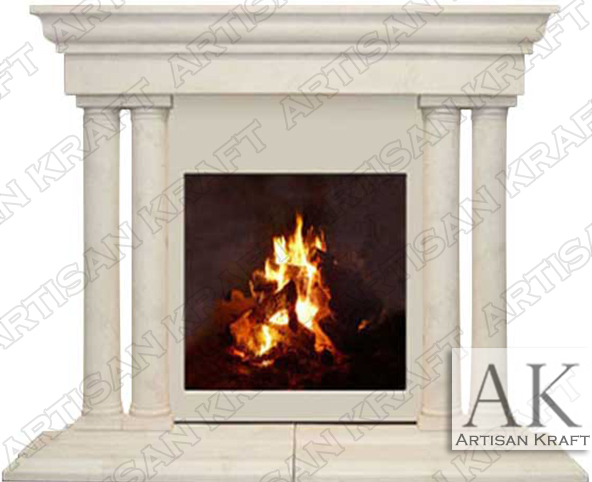 The Grand Tuscan is named after the two plain half round columns that flank the sides of the firebox. When made from cast stone there are typically seams in the mantel shelf and hearth. GFRC and Precast are names that are used at times to describe cast stone. Our cast stone is superior to precast due to the limestone materials used. Thus, It looks and feels like real limestone. These fireplaces are in comparison lightweight and can be made in a range of colors and textures. Consider having the Grand Tuscan made from sandstone or marble. Material: Limestone, sandstone, marble, travertine etc.